It was a busy week with fair, but we still made the trip to the annual Michigan Fiber Festival this year. Fiber animals, fleece and skein competitions, herding demonstrations, and a lot of vendors with all sorts of fiber goodies! It was a nice break from the everyday. I always enjoy the sheep show, so many lovely woolly sheep to admire. I have told myself no more new sheep... but, that doesn't mean I can't buy their lovely fleeces. 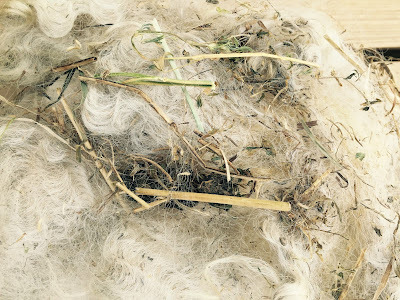 One of the farms that were showing their sheep, had some raw, skirted fleeces for sale- Leicester Longwool, and CVM/Romeldale fleeces, two types that I have never processed before. We have bought quite a few fleeces over the last two years, some that we were thrilled to have and others that ended up being not so nice. I have learned to look through the fleeces more carefully, especially when you are buying from someone who really does not know much about wool. 1. Cleanliness- How clean is the fleece? Wool is typically dirty, especially raw wool, which has not been washed. I expect to find lanolin/grease and some VM (vegetable matter). How much VM, is what I am looking at. I have purchased wool in bags, without pulling it out. I was told it was reasonably clean, and from the surface, it looked pretty clean. Then comes the disappointment when you lay it out on the skirting table and find so much VM, that the wool is not really usable except for garden mulch. After experiencing that twice, I pull the fleeces out of the bag. 2. Soundness-You want to buy a fleece that is structurally sound. We remove a lock of the wool from the fleece and look it over. Check the crimp, give it a tug to check for breaks. Mike does the "sound test" he puts it up to his ear and listens for a kind of "ping" sound when he snaps the wool. You do not want to hear a crackling sound, which means weak fiber. These are the first two things we look at when considering a fleece. Staple Length; When I want to process the wool into roving, I need to keep the staple length in mind. My carding machine does not like wool locks that are over 7-8 inches long. I also do not like working with wool that has a short staple, less than 2 inches. Breed of Sheep: I am interested in trying all types of wool, so if I have not yet processed it, or spun it, I am interested in trying it. But, it if you are buying wool for a project, breed may matter. You probably would not buy a Karakul fleece if you are making a next to the skin garment, but it may be a great choice if you wanted to make a rug. If you are looking to needle felt, some wool would work better than others. So if buying a fleece for a specific project, you would want to do some research before choosing a fleece type. 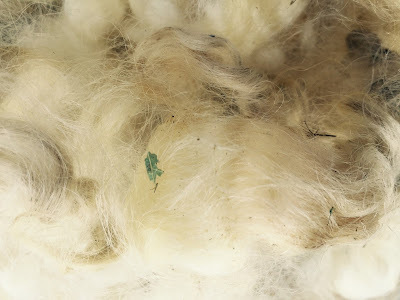 Skirted Fleece: I have purchased fleeces that have not been skirted, which means that the undesirable wool is mixed in with the good parts of the fleece. That can include, dung tags, belly wool etc. I prefer, at least, a lightly skirted fleeces where those two things have been removed. 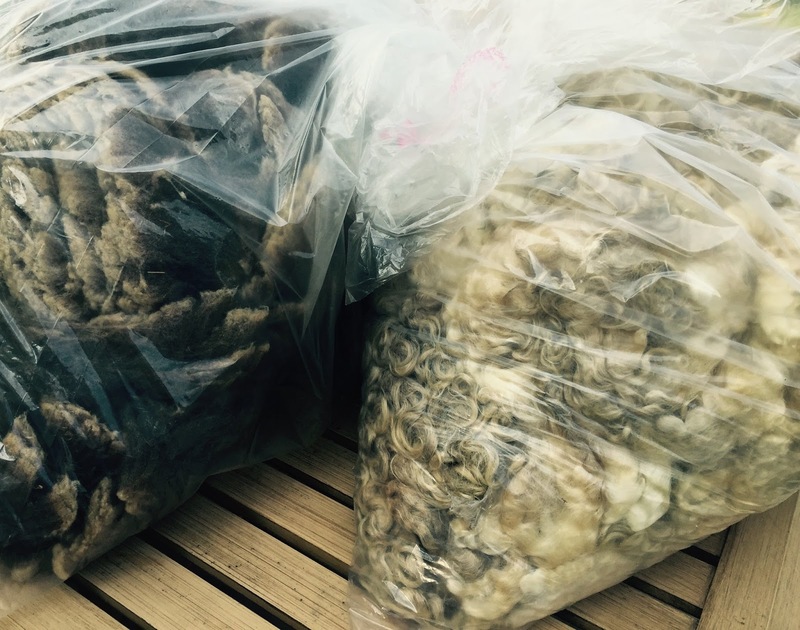 Who wants to pay for sheep poop? Not me! The fleeces I purchased this weekend were skirted. Second cuts-this is done by the sheep shearer and leaves shorter pieces of wool throughout the fleece. If the fleece has a lot of second cuts, I pass it up. Scurf- Flakes of skin on the wool. It does not wash or card out of the fleeces. It is caused from a condition on the sheep (mites) Pass! 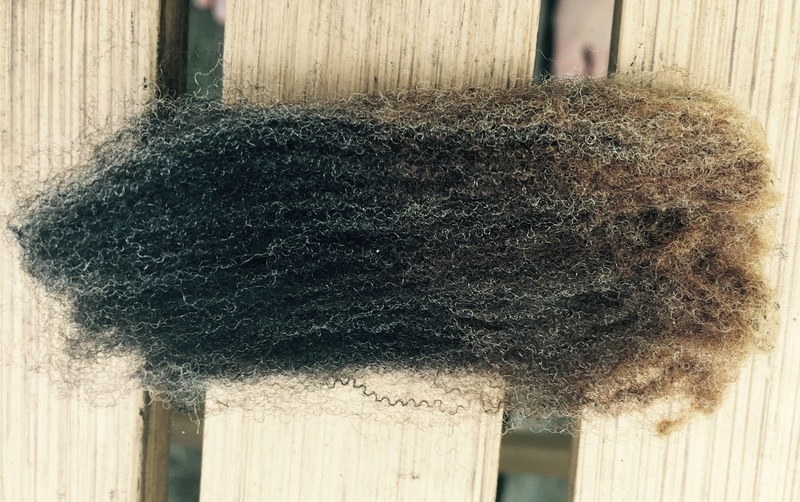 Canary Stained Wool-An organism that causes yellowing in the fleece. It causes a gummy substance in the wool and will not wash out or dye. It is a bright yellow color, unlike the pale yellow you can get from lanolin. It weakens the fleece as well. Over the years I have purchased some "cheap" wool and more times than not, it was worth just about what I paid for it, sometimes less! I have learned to be more careful when selecting a fleece. I pay more, but what I end up with is more usable wool and it is worth every penny. I have been cut off from buying more sheep, but that doesn't mean I cannot enjoy all of the types of wool that are available. Fiber Show anyone? All are wonderful tips Sandra! I would love to attend the Michigan Fiber Festival! Sounds and looks like you had a great time! It is a really nice festival! Great post, Sandra! I wish I had known all this years ago when I bought my first fleece. All I knew was I wanted to spin some yarn, lol, and I bought a 4-horned Jacob's sheep fleece. It was in terrible shape, but I learned my lesson. Love the colors in the last pic. Gorgeous. I would love to have visited and experienced this! I learned the hard way from buying wool off the internet. I have not bought any raw fleece off the internet. I have sold some that way. Much easier buying it in person.